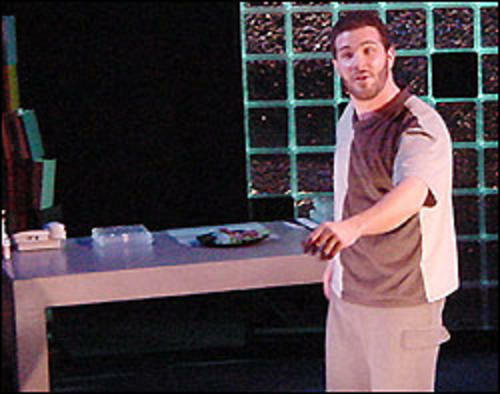 Co-produced by Joshua Berg and Inverse, directed by Rob Urbinati, and written by Kirk Wood Bromley, SYNDROME is a play about a man who is “perfectly normal” – except for his Tourette Syndrome, Attention Deficit/Hyperactivity Disorder, Obsessive Compulsive behavior, and Bipolar personality traits. Through the course of an evening at home, we are given a glimpse into his cognition, emotions, fascinations, memories, tics, and obsessions, all brought to the surface by a simple expectation – meeting his parents for dinner. Adding to the drama of the piece is the fact that the star of this play, Joshua Lewis Berg, has Tourette himself – as he portrays a character with a multitude of individual tics, his own personal tics may come to the surface. Partly based on autobiographical material from Mr. Berg’s own life, SYNDROME is the first play to take an in-depth look at the mind and experience of someone with Tourette. In the course of this performance, the audience will see Berg telling the real-time story of a Touretter preparing himself for “social behavior,” ticcing on stage, attempting to overcome his tics, and relating the pivotal moments in his life story that pertain to his condition. His ultimate goal is to be rid of his Syndrome so that he can be normal and meet his parents free of his symptoms. What truly sets SYNDROME apart from other plays and films about Tourette is that it is being performed by a Touretter, and that the text – rich with tics and obsessive compulsions – is about the ultimate challenge of eradicating one’s syndrome once and for all through the process of reliving one’s life story. Joshua Lewis Berg has appeared in several of Mr. Bromley’s plays, as well as regionally in his native Detroit, and in Moscow, where he was a founding member of Durdom, Russia’s only English language improvisational theater company.